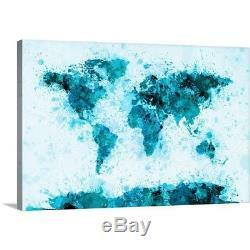 Premium Thick-Wrap Canvas Wall Art entitled World Map Paint Splashes Blue. Canvas is 1.25 inches deep. Our proprietary canvas provides a classic and distinctive texture. It is acid free and specially developed for our giclee print platforms. The fabric base is flexible to support tight corners. The finished print is mounted on a sturdy board to protect against shrinkage, deforming or over-stretching. Each print is produced with our own archival UV quality inks supporting a vibrant color gamut, while being scratch and fade resistant. Our photographic grade pigment based inks were developed for outdoor advertising products and are designed to withstand a wide range of environmental conditions. Each premium canvas gallery wrap finished with a closed back preventing dust collection inside the back of the wrap. The back includes a pre-installed, ready-to-hang sawtooth hardware. 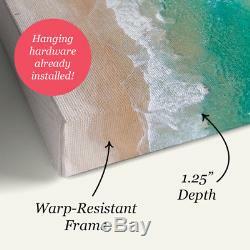 Our stylish framed wraps also come with pre-installed hanging hardware built into the frame. This frames are made from a recycled material that makes them environmentally friendly as well as solid, durable and lightweight. Since 2006, Great BIG Canvas has been leading the industry in art and photography reprints. Shoppers can view our constantly growing online collection, which includes fine art photography, abstract art, and renowned masterpieces. Based in Raleigh, North Carolina, Great BIG Canvas specializes in creating high quality artwork that's printed on demand, which means items are hand-crafted specifically for each customer when an order is placed. Great BIG Canvas offers décor solutions for both home and commercial settings, including corporate offices and retail spaces. As our name implies, we offer some of the largest art prints in the industry. We warrant and represent that the goods are as described in the above listing. We specifically disclaim any implied warranties of title, merchantability, fitness for a particular purpose and non-infringement. Customers should satisfy themselves that any item choice made is suitable for their intended purpose or use. We pride ourselves on our customer service. Please note that due to differences in monitors, the colors you see on your computer may be slightly different on the print you receive. We print colors true to the artist's specifications and cannot alter the original artwork. Larger canvases and large quantity orders may take longer to produce. From early November to mid-January the production times may also increase due to the holiday season. If you have a PO Box please provide the PO BOX number as well as the street address to insure that there will be no issues delivering your package. You may also be interested in.. The item "Premium Thick-Wrap Canvas Wall Art entitled World Map Paint Splashes Blue" is in sale since Wednesday, December 16, 2015. This item is in the category "Home & Garden\Home Décor\Posters & Prints". The seller is "greatbigcanvas" and is located in Raleigh, North Carolina. 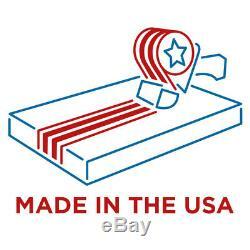 This item can be shipped to United States, Canada, United Kingdom, Denmark, Romania, Slovakia, Bulgaria, Czech republic, Finland, Hungary, Latvia, Lithuania, Malta, Estonia, Australia, Greece, Portugal, Cyprus, Slovenia, Japan, China, Sweden, South Korea, Indonesia, Taiwan, South africa, Thailand, Belgium, France, Hong Kong, Ireland, Netherlands, Poland, Spain, Italy, Germany, Austria, Israel, Mexico, New Zealand, Philippines, Singapore, Switzerland, Norway, Saudi arabia, United arab emirates, Qatar, Kuwait, Bahrain, Croatia, Malaysia, Brazil, Chile, Colombia, Costa rica, Dominican republic, Panama, Trinidad and tobago, Guatemala, El salvador, Honduras, Jamaica.